Polar bear hunting has risen an estimated ten percent over the past few years, according to reports of the biennial meeting of the international Polar Bear Agreement began this week in Moscow, Russia. Despite recent threats that two-thirds of the species could be lost by 2050, 740 of the animals were shot in 2012 by hunters in Canada, the only country where hunting the species is still legal and where 15,000 of the world's estimated20,000 to 25,000 polar bearslive. This number surpassed the average over the previous five years of 663. According to a 2012 NRDC report, from 2007 to 2012 there was a 375 percent increase in the number of polar bear skins offered at auctions. The animals are prized for their valuable hides, which can garner up to $12,000 a piece. No concrete action was taken at the meeting, which marked the 40th anniversary since the signing of the 1973 Agreement on the Conservation of Polar Bears. But officials say they are hopeful and will meet again in 2015 to sign an action plan on polar bear conservation. "This is an important moment in polar bear conservation," Jim Leape, chief of the World Wildlife Fund's International Secretariat, told The Moscow Times. "It is important to recognize that this collaboration has worked over the last 40 years. We have several populations that are healthier than they were before. 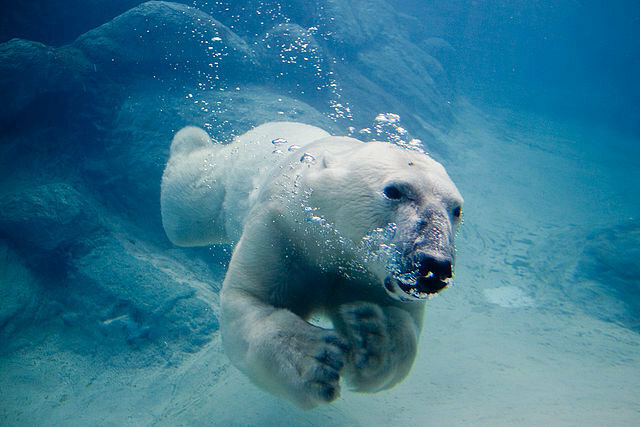 We are at a moment when we have to do much more to save the polar bear."